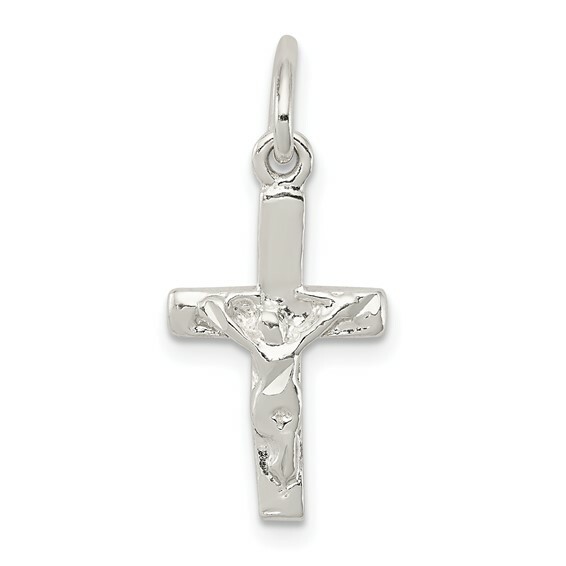 Small crucifix charm is made of polished sterling silver. Item size: 5/8 inch tall by 3/8 inch wide without bail. This item is smaller than a dime. Weight: 0.74 grams. Crosses with a representation of the body of Christ, or corpus, are crucifixes and recall the death and resurrection of Christ. Its used for a rosary bracelet, and this size is hard to find. It looks delicate, but it's quite sturdy.Very well made.|The only negative, which might be silly is that would've like to have known where its made.